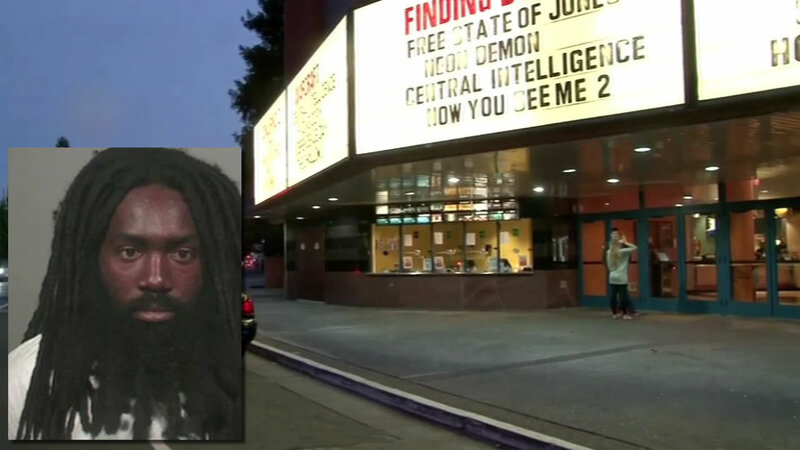 SANTA ROSA, Calif. -- A suspect already charged with stabbing a man in a movie theater in Santa Rosa last month has been arrested for a fatal stabbing in the city two days earlier, police said today. Santa Rosa police today arrested a man who already has been charged with stabbing a man in a movie theater with the murder of another man, both in Santa Rosa last month, a police sergeant said. Delonte Anthony Hart, 23, was arrested on suspicion of the stabbing death of Cirak Mateos Tesfazgi in the 400 block of Riley Street on June 27, Sgt. Josh Ludtke said. Tesfazgi was stabbed more than 50 times. Police found a large chef-style knife at the murder scene that was taken from the Macy's store in the Santa Rosa Plaza shopping center, Ludtke said. The knife was included in a Chef Knife package sold in the store, and Macy's employees found the packaging on a stairwell outside the store, according to Ludtke. Police reviewed several days of video inside Macy's and eventually saw the knife theft suspect on video leaving the stairwell where the packaging was found, Ludtke said. Detectives also saw the same suspect near the murder scene around the time the fatal stabbing occurred. The Santa Rosa Police Department's Downtown Enforcement Team identified Hart as the suspect in the video based on several casual encounters the team previously had with him, Ludtke said. Hart was already in custody after he allegedly stabbed Adam Lucero, 21, on June 29 inside the Roxy Stadium 14 movie theater complex in downtown Santa Rosa. Police recovered that knife, which was identical to the Tasfazgi murder weapon, from a garbage can, Ludtke said. Lucero, a Los Angeles area resident, recently found a job in San Francisco and was living in the Santa Rosa area, according to Lucero's brother Mike Lucero. The stabbing was apparently unprovoked and Lucero did not know the suspect prior to the stabbing. Police said Tesfazgi's blood was found on Hart's clothing and Hart's fingerprints were on the chef's knife found at the June 27 murder scene. Hart is new to the Santa Rosa area but left Baltimore and had previously spent time in the Bay Area and Southern California, Ludtke said. He is being held under $1.1 million bail in Sonoma County Jail and is scheduled to appear in Sonoma County Superior Court on Wednesday morning.